Vandoorne won again in Abu Dhabi. © Sam Bloxham/GP2 Series Media Service. 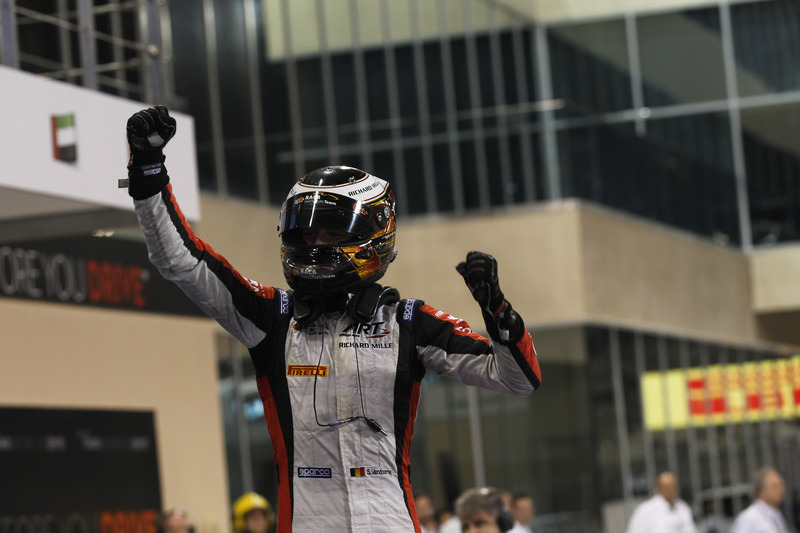 Stoffel Vandoorne took his fourth GP2 Series victory in superb style at the Yas Marina circuit today. Series champion and DAMS man Jolyon Palmer finished 2nd, while RUSSIAN TIME’s Mitch Evans completed the podium. From pole, the ART Grand Prix man led the field with relative ease, as Palmer, Felipe Nasr (Carlin), Evans and Stéphane Richelmi (DAMS) fought to settle the top five positions early on. Vandoorne was in the process of building an early lead while the tussling continued, with Nasr easing past Palmer on the far end of the circuit to slot into 2nd spot. This lead would be slashed early doors however, when an over-optimistic Rene Binder clattered John Lancaster in the turn 9/10 chicane, with the stranded duo also collecting the innocent Marco Sørensen in the process. After two-and-a-half laps, Vandoorne raced back into the lead, while the Nasr / Palmer battle continued in his mirrors. It would prove crucial, for while they turned and posed, with Palmer retaking 2nd place, Vandoorne made good his escape, with the Belgian building a 4.1s gap to the chasing man. Nasr followed Vandoorne in – the pair ridding their machines of the supersoft Pirelli tyres at the end of six tours. Now leading the pack, Palmer gapped the now 2nd place Evans, but only to the tune of 2.5s, as the soft tyre shod Vandoorne slipped to 11th, but in clear air for a time. With temperatures having plateaued, Palmer set a solid pace, but Vandoorne held a gap of approximately thirty seconds to the DAMS racer, but with laps ticking away, Vandoorne would have to make hay. Some time was lost behind the struggling Artem Markelov and Jon Lancaster, with Vandoorne clashing with Lancaster’s Hilmer machine as he swept by at the beginning of lap fourteen. That Palmer emerged eight seconds adrift of the leading (again) Vandoorne may be viewed as punishment enough for the Englishman. On fresh supersofts, Palmer pushed hard and had closed the gap to Vandoorne to 5.5s – setting the fastest lap in the process – but after six laps, his tyres had cried enough. Vandoorne’s steady pace and intelligent drive, especially in the early part of his second stint earned the Belgian more than enough air to easily clear the opposition and with Palmer’s tyres fading, Vandoorne made a 12.1s gap to the next man by the flag. It is a result that allows the McLaren to leapfrog Nasr in the standings, with Vandoorne taking a nine-point gap into the final race tomorrow morning. 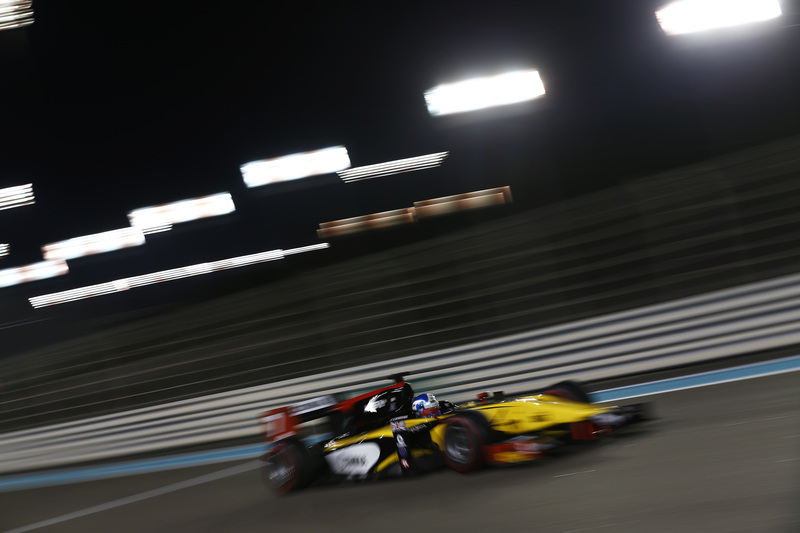 Palmer settled into the runner-up position, a long way ahead of Evans, whose tyres had also faded in the later laps. Stéphane Richelmi drove a feisty race in the early stages, but the Monegasque driver will rue a poor start, during which he fell from 3rd to 5th. On paper, Richelmi made no further moves from there, but like Nasr, the 24-year-old became locked in the midfield at the very time he needed to push harder. Richelmi did take Johnny Cecotto Jr in the final tours, demoting the Colombian to 6th, while Stefano Coletti made the most of an early stop from the medium tyres to claim 7th. Coletti looked as if he might drop back prior to the end, but Arthur Pic did not have enough time to take his Racing Engineering rival, with the Frenchman coming home just 0.245s adrift of Coletti at the final flag. If nothing else, Pic will lay claim to the reverse grid pole position. Rio Haryanto took a competent 9th for Caterham, while Danïel de Jong passed a struggling Raffaele Marciello on the last lap to claim the final point. The race was not without its silliness. André Negrão retired from the race when an ill-conceived move of Pierre Gasly effectively took Negrão out of the event, while also having damaged Gasly’s front wing. Series champion Palmer took yet another podium for DAMS. Sam Bloxham/GP2 Series Media Service.